The Equal Opportunity Act of 1964 authorized and funded populations or consortiums of populations of 50,000 or more to become Community Action Agencies (CAAs), to receive various funds to operate a variety of programs to help the poor help themselves, and to assist in eliminating poverty. 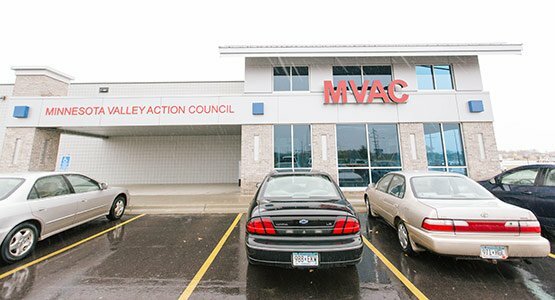 Under the laws of the State of Minnesota, Minnesota Valley Action Council (MVAC) was incorporated as a Community Action Agency in March 1966, to serve people of Blue Earth, Brown, Le Sueur and Nicollet Counties. In 1974, Sibley County was added to the MVAC service area; and Waseca County was added in 1975. In 1978, Faribault, Martin and Watonwan Counties were added. MVAC now serves the entire nine counties of the Governor’s Economic Development Commission, Region Nine. MVAC is a private, non-profit organization that uses federal, state and local resources to provide assistance wherever needed. It is a local institution working on local problems within the widest possible spectrum of local needs and interests. MVAC is not the government, nor is it a political entity. Nine members of the Board of Directors are representatives of the low-income community and must be elected by their peers. Nine members are private individuals who are selected through a petition process and the other nine are elected public officials. This Board configuration offers the opportunity for needs and priorities to be established by a panel of peers of those being served. It is intended to move poverty programs out of the political arena and back to the people for decision making.